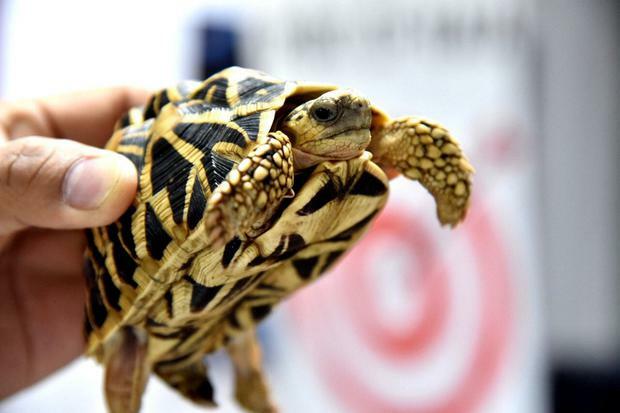 A collection of 1,529 live tortoises and terrapins has been rescued from a smuggler's luggage in the Philippines. The exotic species were spread across four bags owned by one passenger travelling from Hong Kong. The species included star, redfoot and sulcata tortoises as well as red-eared terrapins and were worth 4.5 million Philippine peso (£65,623) on the illegal wildlife market. The creatures were discovered after the bags were X-rayed at Ninoy Aquino International Airport in Manila. The Filipino traveller who owned the bags left them unclaimed in the arrivals area, but could face a prison sentence of one to two years or a fine of between £291 and £2,916. In 2018 the airport discovered a toal of 560 items being smuggled due to the illegal wildlife trade, including 250 geckos and 254 corals smuggled in parcels, baggage and in shipments. The airport has also apprehended 63 iguanas, chameleons and bearded dragons this year. The reptiles were turned over by the Bureau of Customs NAIA to the Philippine Department of Environment and Natural Resources Wildlife Traffic Monitoring Unit.